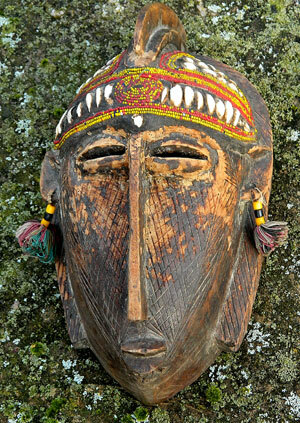 A: It is a primitive Himalayan mask. Only a few of them are carved with smiles. Let’s attribute it to the Monpa people in mountainous Arunachal Pradesh. 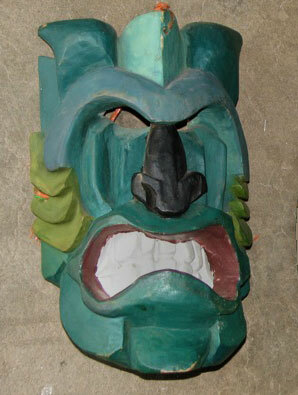 I have seen masks like this from Nepal and far to the east Himachal Pradesh. 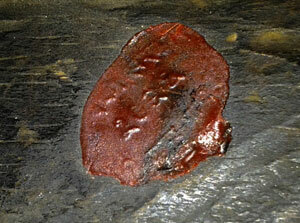 The red wax seal I used to see on mask from Nepal, where they tried taxing them for a few years. I wonder if those seals are used in other areas. Age and authenticity can only be determined by an expert. I won’t value this mask because authenticity has not been determined. I lived in Nepal from 1979 to 1987. When you took older crafts out of Nepal during that period you first had to take them in to some sort of archaeological office for examination. 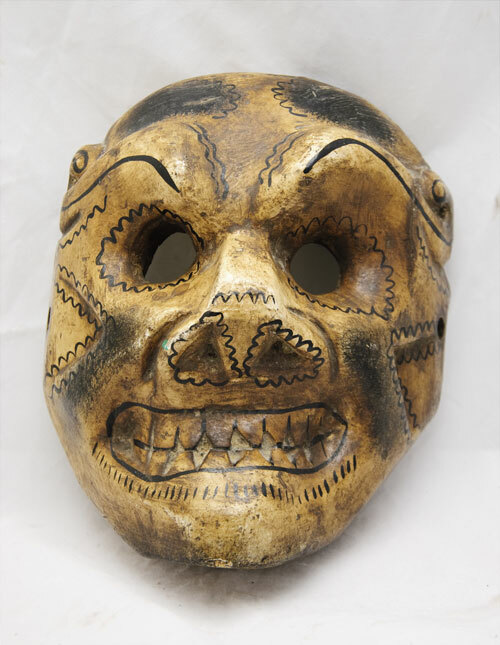 If the craft piece was exportable they stamped it with a sealing wax seal like on this mask, and I think also gave you a paper. I forget the exact number but it had to be less than 50 or 100 years old, as I recall….something like that. 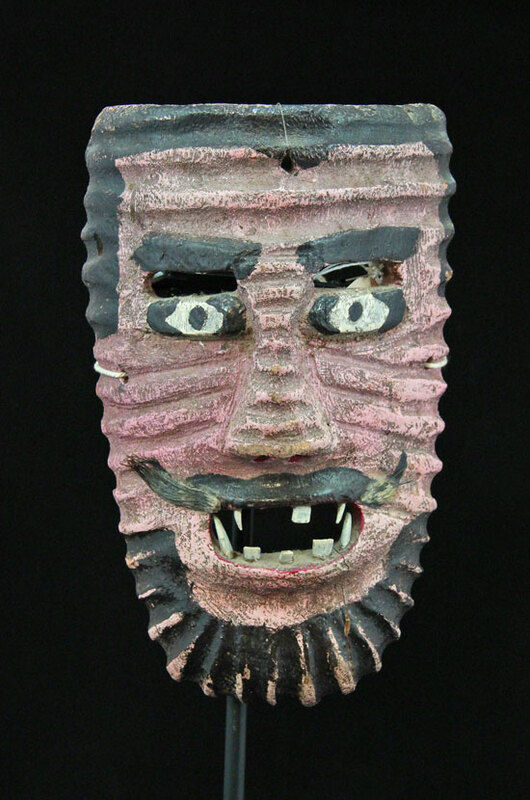 However with Himalayan masks and other hill folk crafts dating is difficult (many are newly made and artificially distressed, but some are authentic and quite old. In 1969 perhaps 25%+ were authentic), and mostly they allowed items like this to leave. The date on the stamp is the year the approval for export was carried out rather than the age of the mask, and since people typically got these stamps a few days before leaving, that’s a fair date for export as well. I had a woodwork shop when I was in Nepal making my designs for export. I noticed two things of interest. A lot of authentic wood objects from the hills were finished with a mustard oil dried over a smoky fire finish which tended to make them look quite old after a few years of use. they were authentic objects, just not as old as they often looked. A second factor was that hot running water and soap were scarce so people tended to have oily skin and when they handled things this came off on the object, attracted dust, adding to the appearance of age. Add to this smoke from cooking fires, and oil lamps. I should add that human skin oil is a drying oil like linseed, tung, and walnut oil, and despite the rather unhappy sound of my description, creates a most beautiful patina on objects frequently handled under these conditions. This applies worldwide, not just in Nepal, and is one of the reasons why old wood objects are often so beautifully patinated, while modern ones where soap and hot water are the norm, never develop the depth of finish given by a myriad of very thin applications of drying oils with constant polishing by touch. Mathew is absolutely right with his opinion. 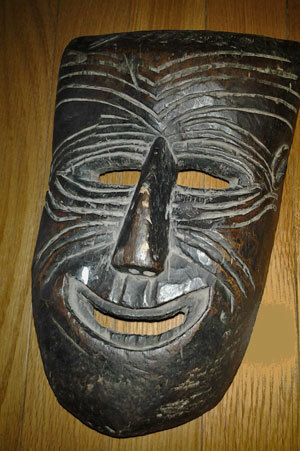 Without looking inside and weighing it (good old masks are usually heavier than copies) it is difficult to give a date. If is is old…l would say that it would be 19th cent. Mathew is correct about the patinas. 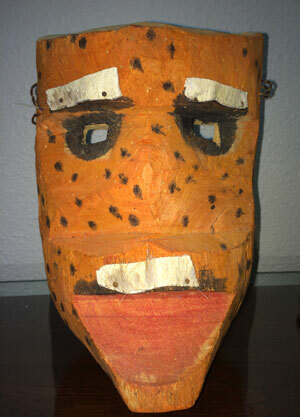 My goodness l have handled hundreds of masks over the years and you do get a good idea of what is old and what is not. Smell of smoke from fires and sticky dirt classic tourist trap typical of a “Five Minute Antique”, not just with mask…Everything! 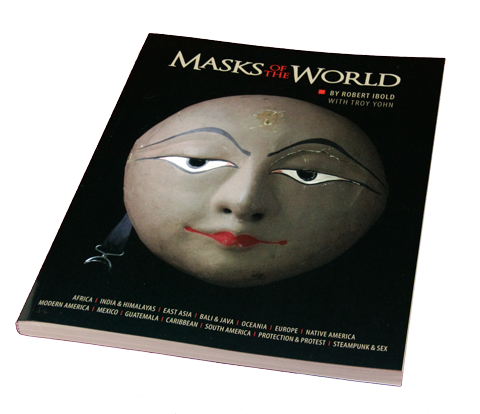 In any case, your mask is very decorative.